You can salvage some nice motors out of optical drives but they can be tricky to control. That’s because brushless DC motors require carefully timed signals used in a process called Electronic Speed Control (ESC). [Fileark] built and ESC using an Arduino and has a couple of posts explaining the concept and demonstrating how it works. 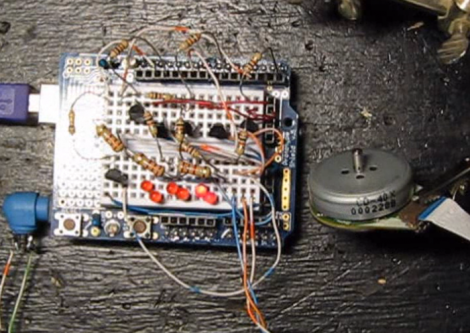 His test circuit uses six 2N2222 transistors to protect the Arduino from excessive current. You can see six red LEDs above which are inline with the base of teach transistor. This gives visual feedback when a transistor is switched, a big help for troubleshooting your circuit. Once you’ve seen the videos after the break you’ll probably come to the conclusion that this is an impractical way to use a brushless motor. But it is a wonderful way to learn about, and experiment with the concept of ESC. Chances are you can get your hands on an old optical drive for free, making this an inexpensive weekend project. 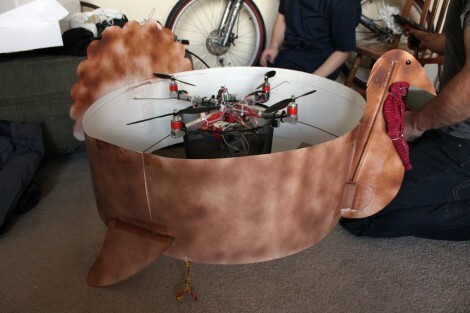 The challenge: can you build a flying turkey that drops pumpkin pie bombs? That’s the question that Utah Aerials asked themselves and they did manage to make it happen. Of course they’re not starting from scratch, but adding a little holiday cheer to an existing quadcopter in the form of a spray painted turkey fuselage. The cheapest pumpkin pie they could find was hung from the copter with care, and dumped thanks to a servo motor. Check the video after the break to see if they were able to hit their balding-bullseye or not. Seems like the wicked witch music should have been the background for that video. 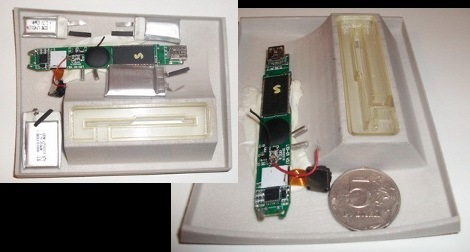 Ubertooth Zero is the first offering in [Michael Ossman’s] quest for a Bluetooth sniffing and hacking hardware platform. We’ve seen some of his hacks in the past, like the build-in guitar tuner and some pink pager fiddling. The Ubertooth dongle is his original design based around an LPC1758 ARM Cortex-M3 processor paired with a Texas Instruments 595-CC2400-RTB1 to handle the 2.4 GHz RF communications. Looking at the bill of materials shows a very low cost for the components at just under $30 (if you can get your hands on a PCB to mount them on). He’s written firmware as well as host code to help you up start pulling Bluetooth packets out of the air as quickly as possible. What can you do with this? That’s up to you, but whatever it is you accomplish, we’d like to hear about it. [Lenore] added a bit of customization to her office window hangings by fitting roller curtains with custom printed fabric. The treatment seen above is a $20 Enje roller blind from Ikea but that logo is all Evil Mad Science. The weight at the bottom of the fabric uses a friction-fit plastic insert that can be stapled onto new material. Some fusible tape was ironed onto the sides to finish those edges, and the roller at the top has strong adhesive that remains for a second use after peeling off the original material. A fabric printer was used to produce this rendition of shades. 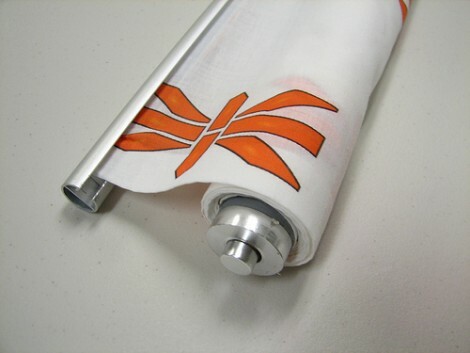 But we’d like to see some conductive thread added for a fabric-based display that can be rolled up when not in use. 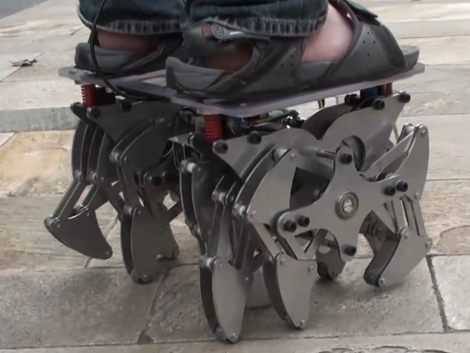 Who doesn’t love a 12-legged robot, especially if you can ride it around work? You can watch this one running around the patio with rider perched atop it. The machine translation is a bit crude, but it seem this is based on the wicked walking sculptures of [Theo Jansen]. The rider can shift their center of gravity to control the walker, much like a Segway. We’d bet this makes for a rough ride on anything but a smooth level surface, but we’re fine with indoor use only. After all, you’ll need to be close to a charging station as this boasts 45 minutes of juice when transporting a 165 pound operator. See it scurry after the break. ATM information theft is nothing new. Neither is the use of skimmers to gain access to the data. But it’s a little surprising just how easy it has become to hack together the devices using audio equipment. The images above are samples of a skimmer for sale from an Eastern-European do-no-good. It is the magnetic stripe sniffer portion of the attack which captures card data as an audio recording. That is later turned into the binary code that was read from the card. We’re just speculating, but that looks an awful lot like the PCB from a pen recorder, something you can pick up for just a couple of bucks. Of course this is used in conjunction with a camera to capture PIN data as the second part of the security protocol, but it really underscores the need for new ATM technology. Some skimmers don’t even require retrieval of the hardware, and you never know where the sketchy machines might pop up next.